The Museum of Modern Art wonders whether unsanctioned, light-footprint design gestures can humanize the world’s megacities. From the January 2015 issue of Landscape Architecture Magazine. In exploding cities around the world, ever-increasing populations of the poor find themselves occupying dense makeshift settlements, or dangerously subdivided apartments, or massive, isolating housing estates. Official planning and development mechanisms seem unable to cope as cities expand in ways that are disorderly, unpredictable, and resistant to the provision of infrastructure and services. Can design solutions redress the imbalance of wealth and poverty that underlies this? Can city dwellers themselves transform dysfunctional places into communities with livable futures? Can an art museum help solve this global problem? These are questions posed by Uneven Growth: Tactical Urbanisms for Expanding Megacities, an exhibition at the Museum of Modern Art (MOMA). 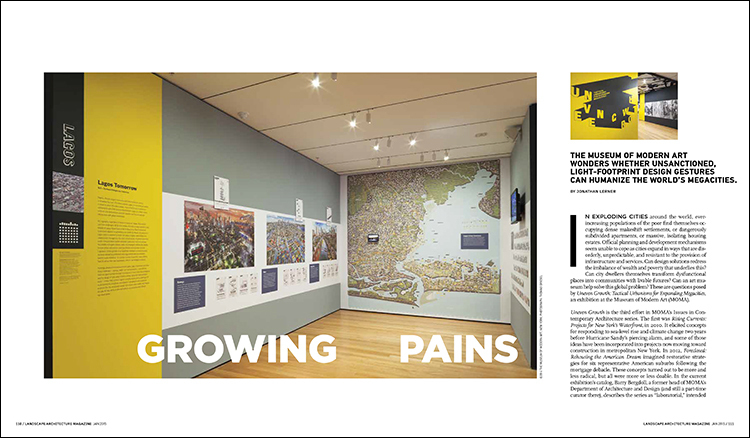 Uneven Growth is the third effort in MOMA’s Issues in Contemporary Architecture series. The first was Rising Currents: Projects for New York’s Waterfront, in 2010. It elicited concepts for responding to sea-level rise and climate change two years before Hurricane Sandy’s piercing alarm, and some of those ideas have been incorporated into projects now moving toward construction in metropolitan New York. In 2012, Foreclosed: Rehousing the American Dream imagined restorative strategies for six representative American suburbs following the mortgage debacle. These concepts turned out to be more and less radical, but all were more or less doable. In the current exhibition’s catalog, Barry Bergdoll, a former head of MOMA’s Department of Architecture and Design (and still a part-time curator there), describes the series as “laboratorial,” intended to formulate and show “experimental results that do not yet exist.” In that spirit, Uneven Growth paired design firms with local knowledge together with others that have international experience on teams asked to work up speculative proposals for six cities: Lagos, Nigeria; Rio de Janeiro; Istanbul; Hong Kong; Mumbai, India; and New York. They were asked to address their city’s situations via tactical urbanism: to consider what could be effected by citizens themselves; to incorporate the cultures of improvisation that overcrowded cities naturally elicit; and to devise interventions that could be made lightly and with limited resources.